Darryl Glenn – Colorado’s GOP U.S. Senate candidate Darryl Glenn may have been a relative unknown up until a couple of months ago, but he has his opportunity to shine tonight at the convention. He will share the big stage with household names like military hero Marcus Luttrell (Lone Survivor), U.S. Sen. Joni Ernst, former U.S. presidential candidate Rudy Giuliani and more. Tune in at around 7:30 p.m. MT to hear Glenn’s speech. Like his state convention speech, it promises to electrify the convention with themes of opportunity, jobs and the economy and national security. Libby Szabo – Jeffco County Commissioner and former state Rep. Libby Szabo will take the stage today at 12:30 p.m. MT to talk about her Hispanic heritage and the need for new leadership – and Szabo has never been afraid to show leadership. Szabo, combined with Glenn, will showcase Colorado’s feisty Western spirit at the national convention. 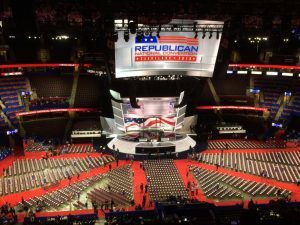 Party planks – As we mentioned before, the GOP platform will have several Western nuggets in it, including states rights, Sage grouse (lack of rights), energy production on public lands and who controls those public lands. This effort speaks to the growing influence that Colorado has over national politics as a swing state. Energy should be a hot topic at each convention and Colorado has a big role to play in energy independence and national security. DumpTrumpettes – The convention may have featured fireworks last night, but the real fireworks may be yet to come as the Cruz campaign Free the Delegates movement, spearheaded by Cruz’s county and state chairs, has not given up on replacing presumptive nominee Donald Trump with Ted Cruz anyone but Trump. Leading the Free the Delegates movement is Colorado activist and Cruz’s Douglas County Co-Chair Kendal Unruh, who has conducted an exhaustive media junket, including appearing in People magazine, in support of her crusade to keep Trump off the ballot. But its not looking good for the effort. Attempts to unbind the delegates through the convention’s rules committee died a swift death last week. However, we suspect this may not be the last the nation hears from this crew as they are mounting a campaign to convince delegates to vote no on the rules. Stay tuned, PeakNation™. Colorado’s fingerprints are all over this convention.